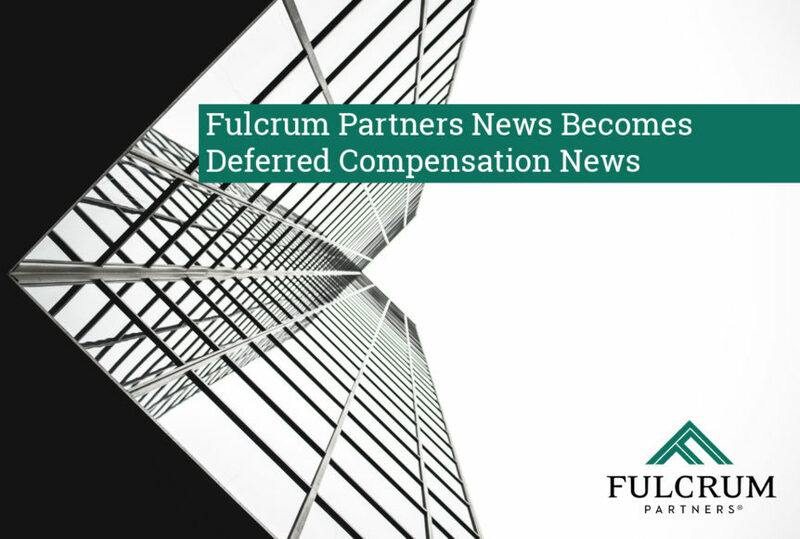 PONTE VEDRA BEACH, FL — (Nov 15, 2018) Fulcrum Partners LLC announces the rebranding of Fulcrum Partners News, which earlier this month became, Deferred Compensation News. The blog and industry news platform began publication in September 2012 with the goal of providing information on deferred compensation and executive pay and benefit plans. Today, Deferred Compensation News brings readers a comprehensive overview of the latest updates on 409A nonqualified deferred compensation; institutional COLI, BOLI and ICOLI; tax-and cost-efficient non-COLI funding strategies; low-cost tax managed non-COLI asset/liability designs; executive benefits benchmarking; succession planning and timely issues of executive pay and benefits. You can read Deferred Compensation News at: fulcrumpartnersllc.com/news/. Fulcrum Partners LLC (www.fulcrumpartnersllc.com) is one of the nation’s largest executive benefits consultancies. Fulcrum Partners is a wholly independent, member-owned firm dedicated to helping organizations enhance their Total Rewards Strategy. Founded in 2007, today the company has offices in Atlanta, Georgia; Chicago, Illinois; Charleston, South Carolina; Columbus, Ohio; Delray Beach, Orlando and Ponte Vedra Beach, Florida; Honolulu, Hawaii; Houston, Texas; Los Angeles and Newport Beach, California; Portland, Oregon; and Washington D.C. Fulcrum Partners is an independent member of the BDO Alliance USA. Learn more about the Fulcrum Partners executive benefits advisory team at https://www.fulcrumpartnersllc.com/fulcrum-partners-team/. Securities offered through Registered Representatives of ValMark Securities, Inc. Member FINRA, SIPC, 130 Springside Drive, Akron, OH 44333-2431, 1-800-765-5201. Investment Advisory Services offered through ValMark Advisers, Inc., which is a SEC Registered Investment Advisor. Fulcrum Partners LLC is a separate entity from ValMark Securities, Inc. and ValMark Advisers, Inc.